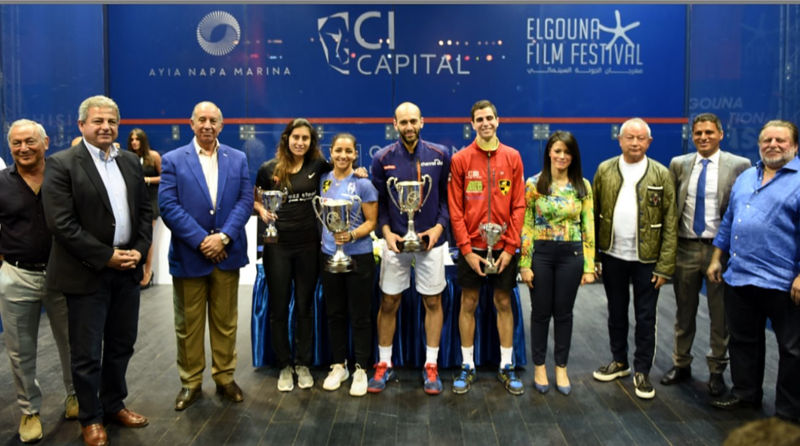 Ranem El Welily and Marwan Elshorbagy are the 2018 El Gouna International Champions after contrasting wins in the finals on the Glass Court at El Gouna’s Abu Tig Marina. 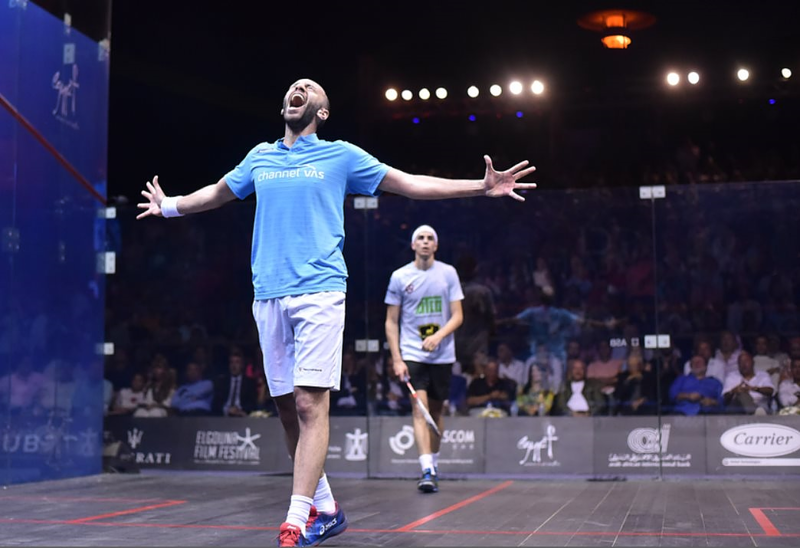 Marwan was dominant throughouht the men’s final with Ali Farag unable to find and answers to Marwan’s attacks and control. 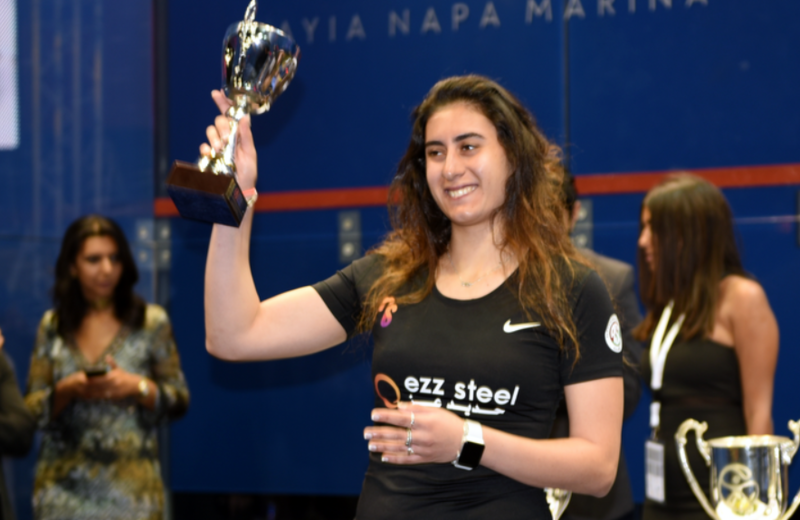 Raneem came from a game down to beat Nour El Sherbini in a repeat of their World Final here a year ago, building up a 10-5 lead in a thrilling fourth games, but then having to save two game balls before finally clinching the title on her sixth match ball. 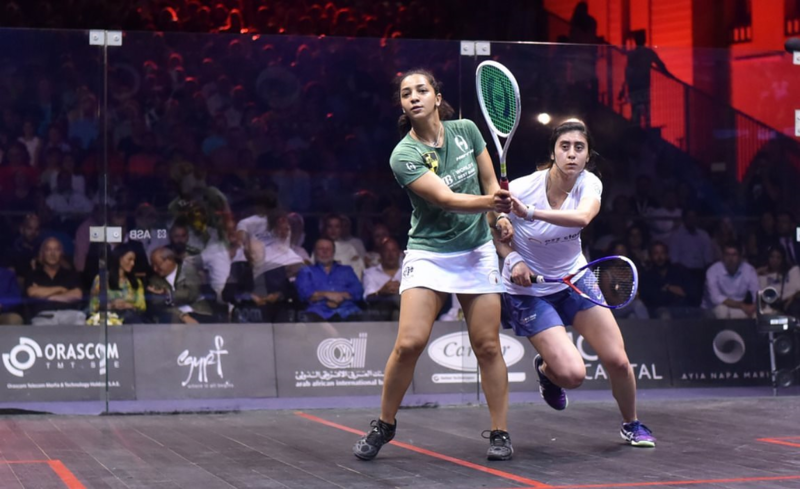 Raneem v Nour – what a match ! Those two players share a great friendship. I remember a quote from Raneem years and years ago, saying that Nour was the purest soul she ever met. And years later, the friendship the respect and the mutual admiration is still vivid between those two. 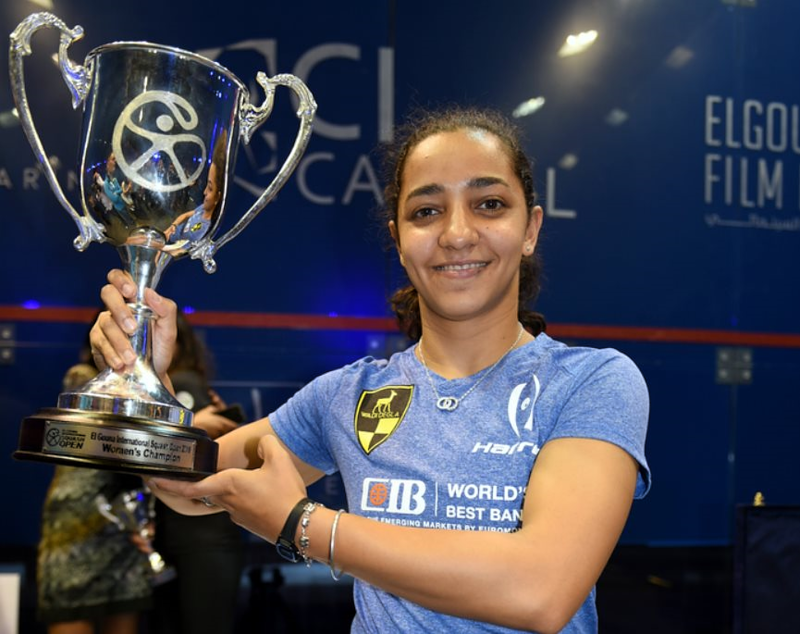 Nour had beaten Raneem three times in 2017 before Raneem was able to impose herself in a 3/1 victory in the World Champs. 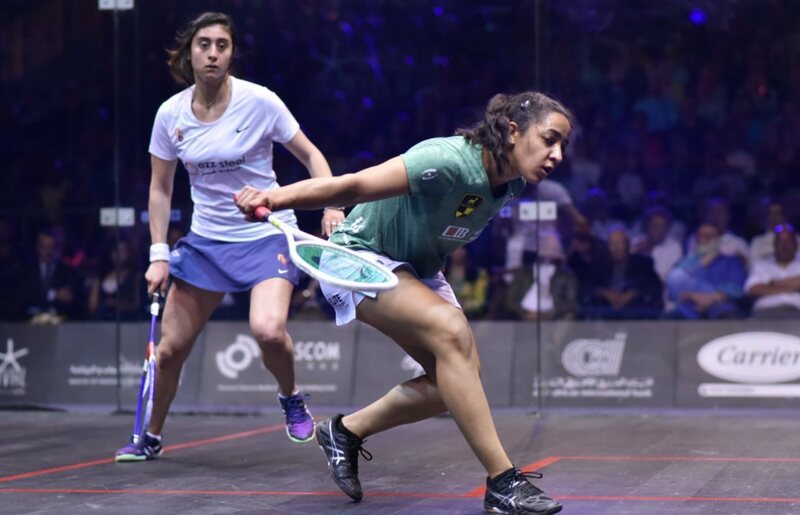 But yet, the next match and their last encounter was a quick affair for Nour, in Saudi, 37m and 3/0. Nour has slimmed down tremendously. She is now working with a nutritionist and it’s working wonders for the Alexandria Princess. If previously she would go for too much too early as she would get a bit tired, now she knows she can rely on her fitness, and just keeps the rallies running, making her lethally dangerous. 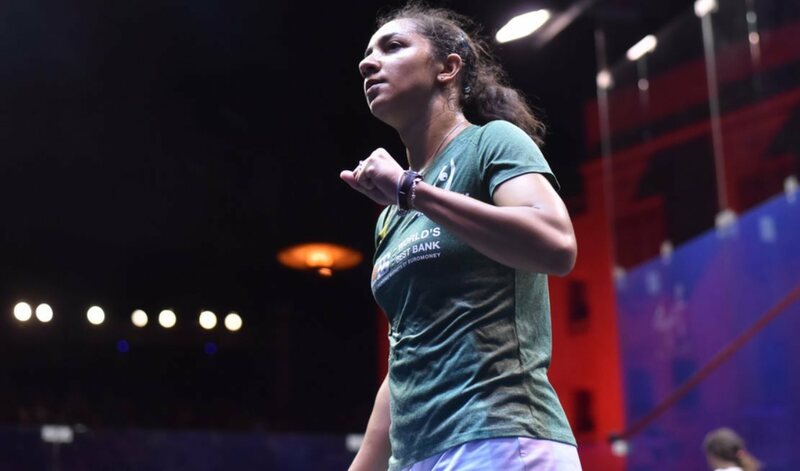 The first game was dominated by a extraordinary confident Nour, playing accurate and sublime squash, 4/1, with Raneem catching up 5/5, but not scoring another point in the game, 11/5 Nour. 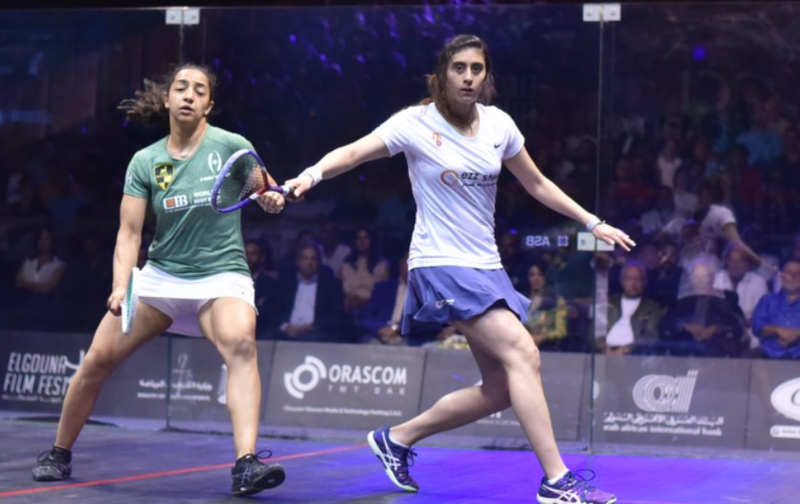 Stats are revealing: Raneem, 3 winners, 4 errors. Nour 4 winners, 2 errors and 3 strokes, 8m. The second is close the whole way, and the stats tell the story: 6 winners each, Raneem cutting the errors, 1 only, 3 for Nour, 2 strokes for Raneem, 1 for Nour. But in the game, this time, it’s Raneem that has her nose in front:6-4 7-5 and if Nour levels it at 8/8, Raneem seems freer than she’s been the whole week, 11/8 in 10m. Nour is completely lost in the third, it’s a quick game, 7m, Raneem just on a roll and all her shots going in, 8/1, 11/3. The fourth seems to go the same route, 3/0, 7/2, 9/3, annnd 10/5. 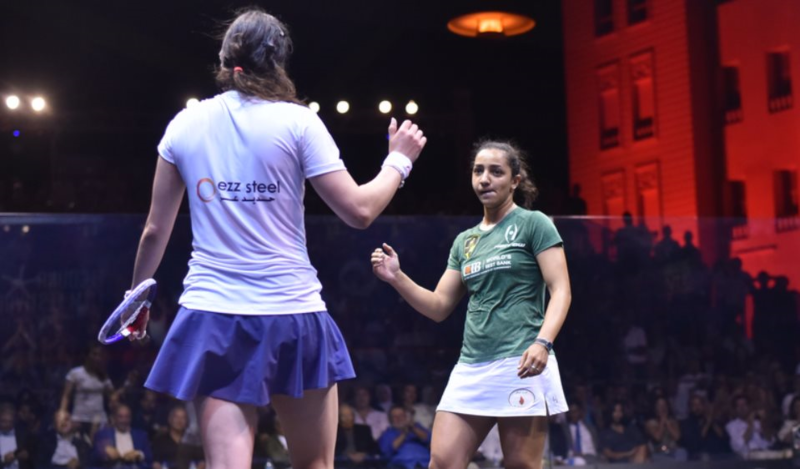 As often with the great champions – Laura is another specialist of the comebacks – Nour suddenly seems to play the best squash of the match! Short rallies with lethal attacks, she strings the points one after the other. Raneem is losing foot “At 10-6, 10-7 you’re still okay but at 10-8 you’re a bit in the danger zone. At 10-9 you’re thinking ‘what have I done?’. At 10-10 I was thinking that maybe I was letting this game go and maybe I would win the next one” she explained later. Raneem was ecstatic… Truly and purely. 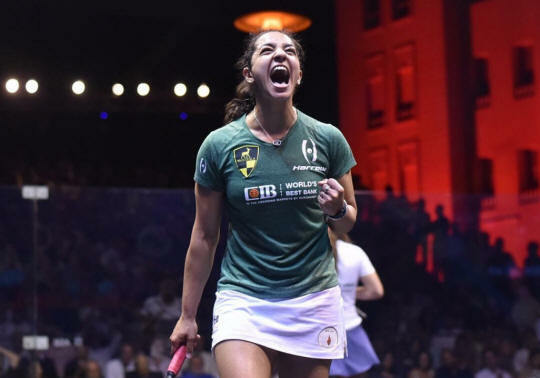 Nour smiled and hugged her friend, but was in tears as she exited the arena… What a match that was. 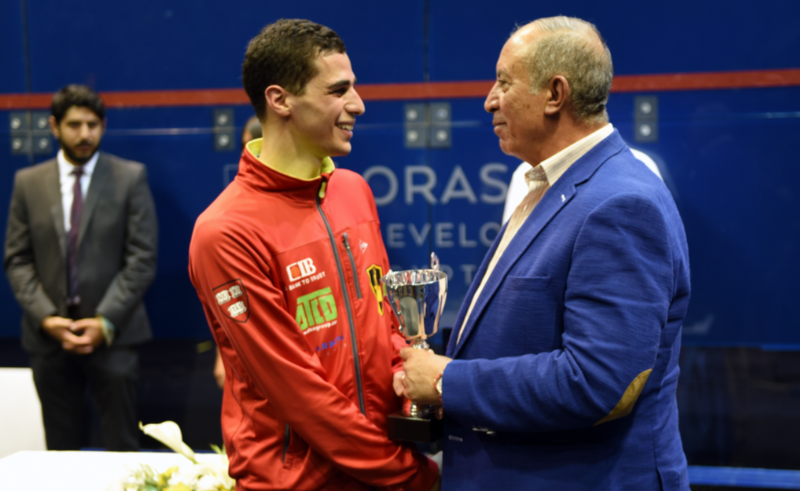 What a match that was, Nour played fantastic and was fighting back all the way to the end. Even at 10-5 down at the end she wasn’t letting go all the way to 11-10. I still can’t believe that, last time it happened I lost that match. I was thinking too much about that today, so I’m very happy that I managed to win it at the end and that I pushed myself. At 10-6, 10-7 you’re still okay but at 10-8 you’re a bit in the danger zone. At 10-9 you’re thinking ‘what have I done?’. At 10-10 I was thinking that maybe I was letting this game go and maybe I would win the next one. So the second, I pushed hard, the third was not too bad but the 4th was a nightmare, a good nightmare eventually! I was smiling on the inside and I’m guessing that might have helped a little bit. I think that may have helped and what a fantastic day it was. 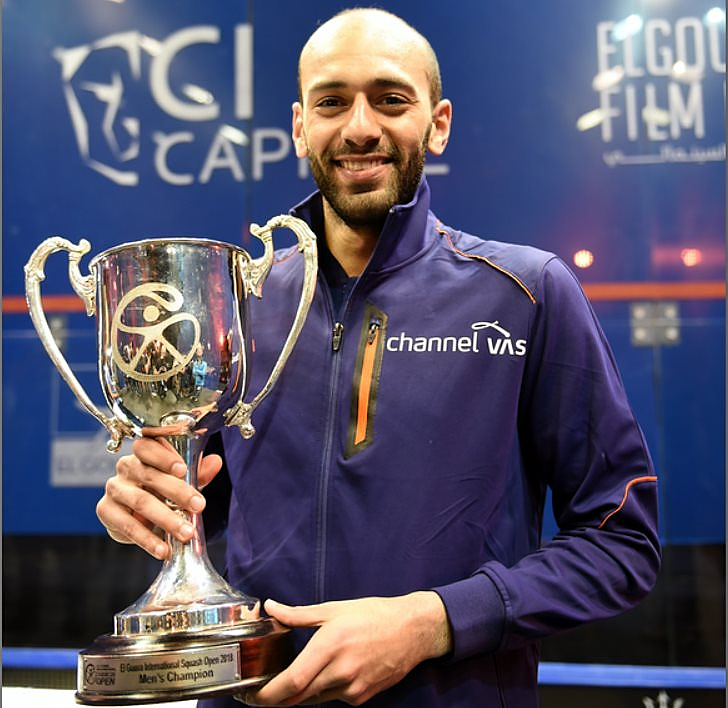 I want to thank Amr Mansi and his amazing team, for organising against this great tournament. 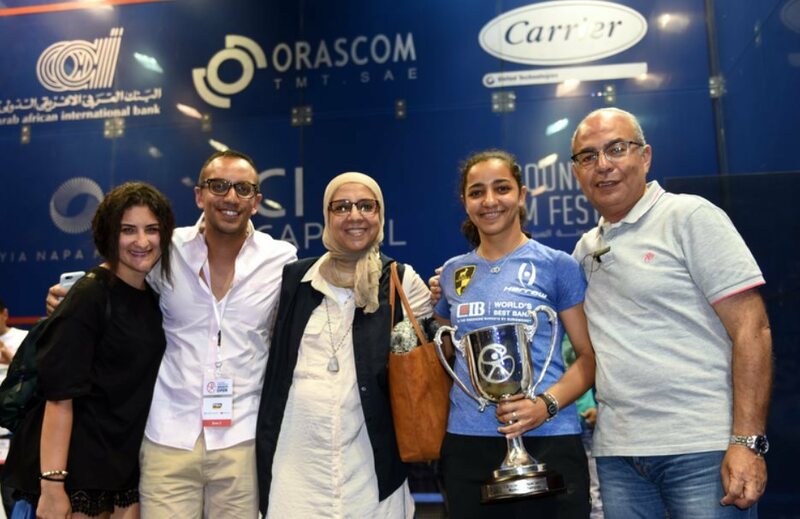 Of course the sponsors of the event, the Sawiris, my coaches, Haitham Effat, Ahmed Faragallah, Mohamd Amin my physio, and my entire family. Nour said some very nice things about me, I don’t know what to say except she is so young, 6, 7, 8 years younger than me? And I learned so much from here, we push each other to become better players, better persons, better humans beings. I grew up watching Raneem and looking up to her. She is the role model all of us are looking up to, she was the best player today and she deserves to win. Of course I’m disappointed but overall, it was an amazing week. I’m happy to be back here where I won my second world title last year. It was wonderful to get to play in front of all the crowd, my coaches and my parents. I can’t wait to come back next year…. 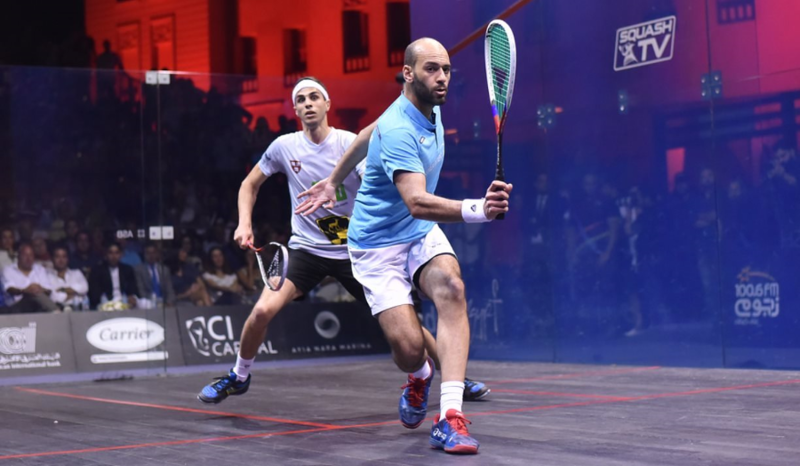 It was a strange match, with a great start from Ali, 3/0, 5/1, 6/3. It really looked like Marwan had spent too much mental energy on his match the night before against his brother, and was going to be flat. Little we knew that it would be the complete opposite. That was actually the last time Ali was in front, as from 8/5, he never scored another point in the game, and would be on the back foot from that point on. Marwan just was too accurate at the back, too relaxed and his game plan took Ali by the throat and never let him breathe again. Marwan never looked threatened in the second and third. 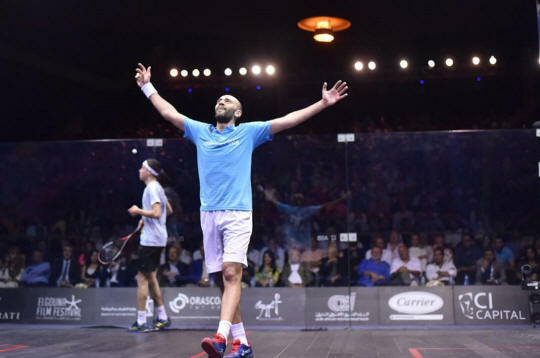 He just soared and looked more and more confident, wining his first ever World Series title in Egypt, Gouna, in one of the most iconic venue of this blessed country. Always when you play Ali it’s a tough battle. We’ve played a few times this season, he’s had a great season and he’s up to World No.2 now which is his best ever ranking. I congratulate him for an amazing season and I’m sure we’ll play many more battles again. 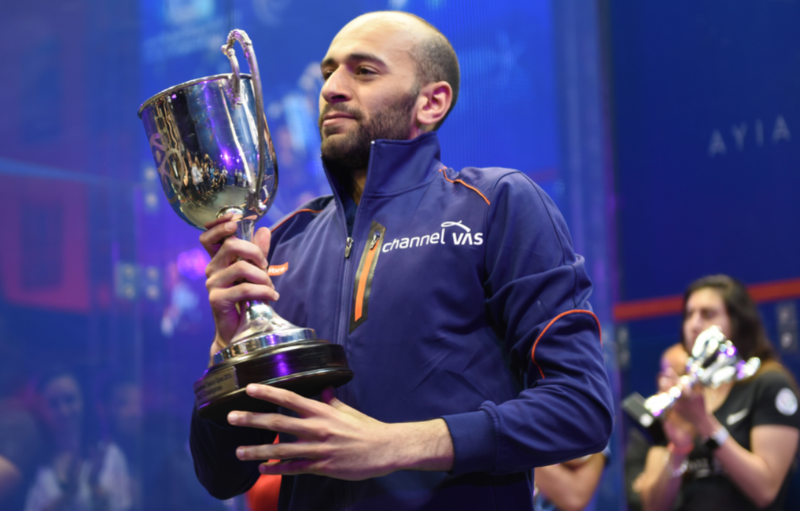 To win my first ever World Series title here in Egypt means a lot to me. Especially to win it here as home means the world. I’ve lost a few major finals before, but coming into this one I just had to learn from the losses I had and I had to be more relaxed and more focused. Me and my coach put a good game plan together before the match. I’m so happy, I’m over the moon and I can’t even describe how I feel. I’m over the moon and I want to thank a few people. 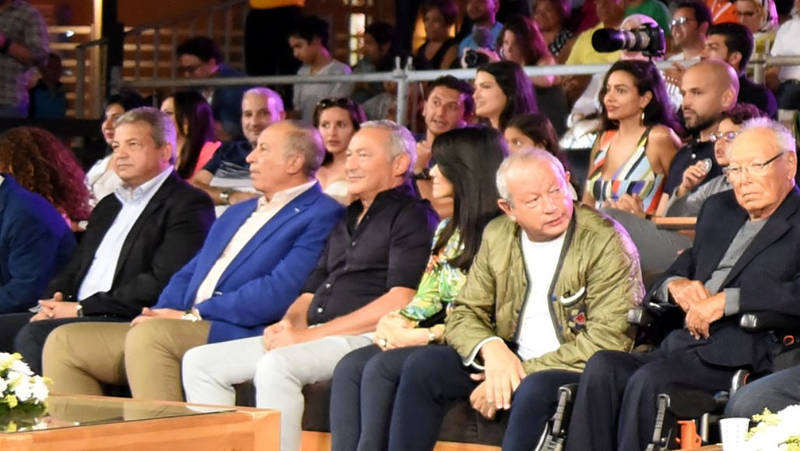 First the Sawiris Family for supporting us always, the players love coming here and it means a lot to us. Also, my coaches, Haitham Effat, Ian Thomas and Hadrian Stiff for their support, we’ve been working together for a few years now. And of course I want to thank my parents who are always there for me. I’m very disappointed with my performance today. I just didn’t have the fire in me today after losing the first game. All credit to Marwan, he never let me back it. I wish for the crowd I would have given them a better performance. Mentally, I didn’t get into it at all. 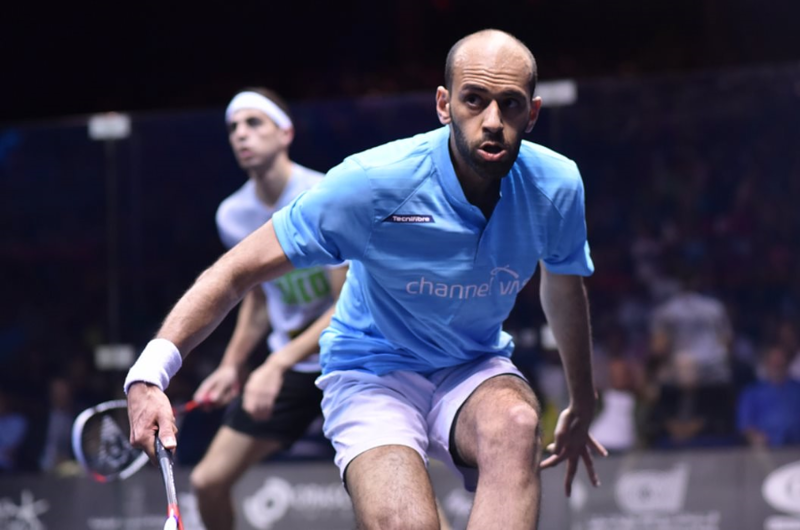 Marwan was so relaxed and composed, his attacking game was spot on, his basic game was relentless. He deserves this win, he got into so many finals, well done for his performance today. 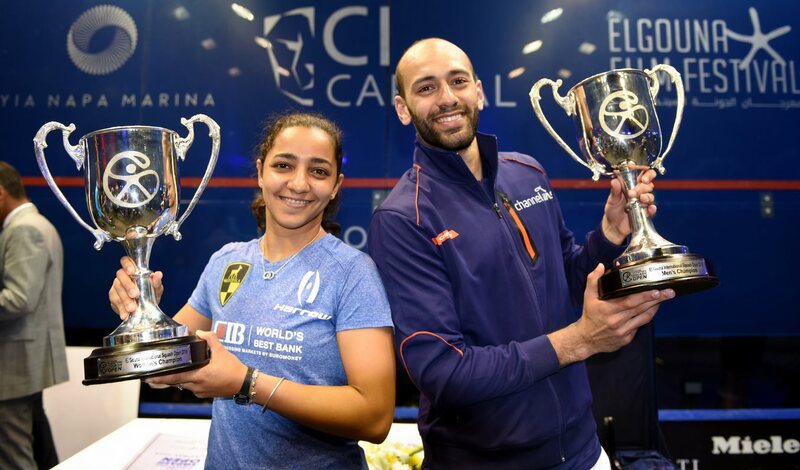 I’m happy and proud to see Egyptian players doing so well on the world scene, the served our flag up. Maybe they are doing so well because the court is not too big and they don’t have to run too much!!! I want to thank everybody for coming again this year. The ranks are growing and growing, I think next year we’ll have to add a couple of extra rows and maybe cross those building up too!